This is a very short instalment to end off the year and share with you what is new In My Kitchen In December 2014. I want to take the opportunity to wish Celia (from Fig Jam And Lime Cordial) and her family a blessed Christmas. I love these #IMK posts and I cannot wait to come back in 2015 and share more with you. This month I have done a lot of baking. I did not post the recipe for the cupcakes that I made. They were part of a competition for Yuppiechef and I used a sponge cake recipe that was given to us, to make these cupcakes. I did not win but my effort was rewarded with a voucher and I have used that in December 2014 to get myself some new attachments for my Kitchen Aid Stand Mixer. We received the most beautiful table gifts at the launch of La Bella Restaurant and Bistro and I have left this cheese board on our table as a permanent fixture. I love the texture of the wood! It came with a cheese knife and fork set. I reckon I have the largest collection of Kitchen Aid attachments and I cannot stop collecting them. I already have drums for medium and coarse shredding as well as slicing and I have now added a potato grater, a drum for stripping (Julienne) and one for fine shredding. I hope to test the fine shredder on horseradish when it is next in season. I had a 15% discount voucher for Le Creuset from the latest issue of Taste Magazine and I used it to buy an espresso mug in their new colour palm. We have an 8 seater dining room table and I wanted 8 espresso mugs to use for desserts. I now have 8 and I cannot wait to use them. At the Baleia Bay Wines launch we were given a wine opener and bottle stopper. I love that the wine opener has a bottle opener on it as well, as that is something most useful in our house. I want to thank each and every one of you for taking a peek into my kitchen in December 2014. I hope that you come back next month to see what is new. i love the wine opener, and the lovely coloured mugs. Most bottles of wine seem to come with screw cap these days so i don’t think it would actually get much use in my house but it is a lovely looking thing. Love the le Cresseut espresso mugs. Especially the new Palm colour. I am a huge fan of their products. Emma. Tandy, my computer seems to be misbehaving, not sure my comment went through. 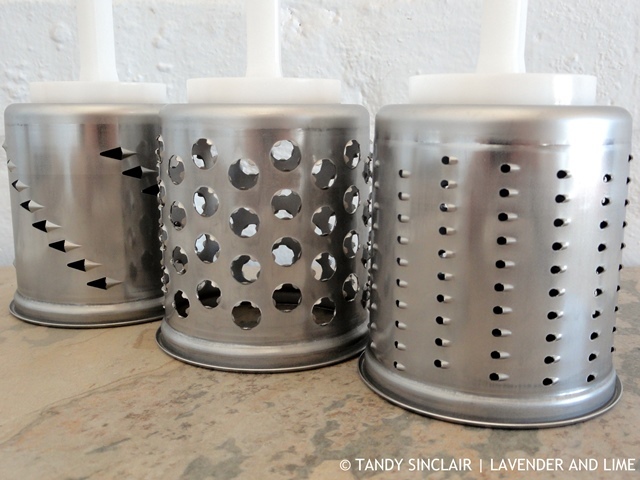 Won’t write all that again, but loved seeing what another home cook/food blogger uses in her kitchen! 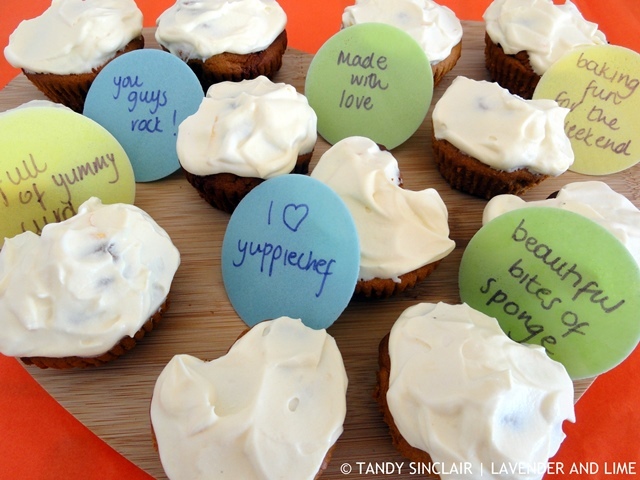 Tandy, I always enjoy seeing what other home cooks/food bloggers use in their kitchens. I posted some of my favorites last week. Love those Le Creuset mugs. Hi Tandy. A lot of people have been show casing those Le Creuset mugs. I can feel a need developing. They are lovely. Oh my, Tandy. Everything in your kitchen this month is amazing. 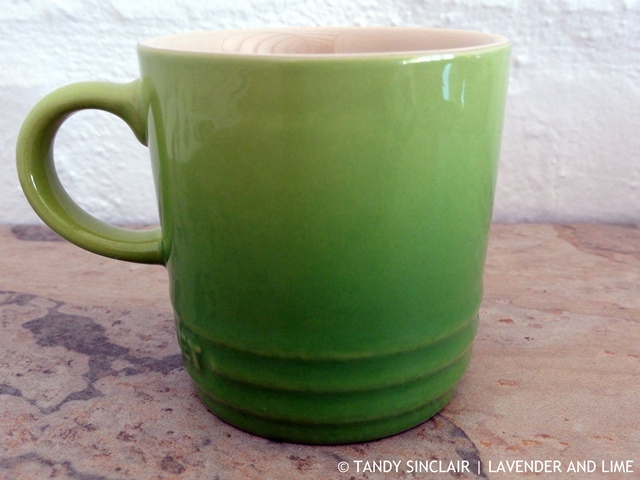 I heart the espresso mugs, they are gorgeous. Which colour is your fave? I’d make the orange one mine. HAHA! And the cheese board with smiley cutlery is cute. 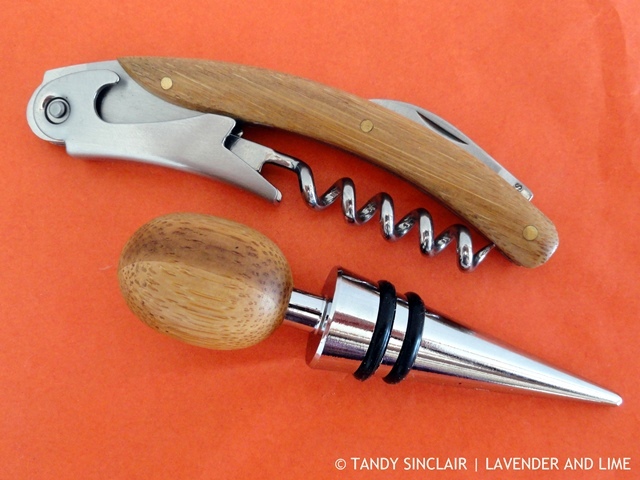 Beautiful wine opener and bottle stopper too. 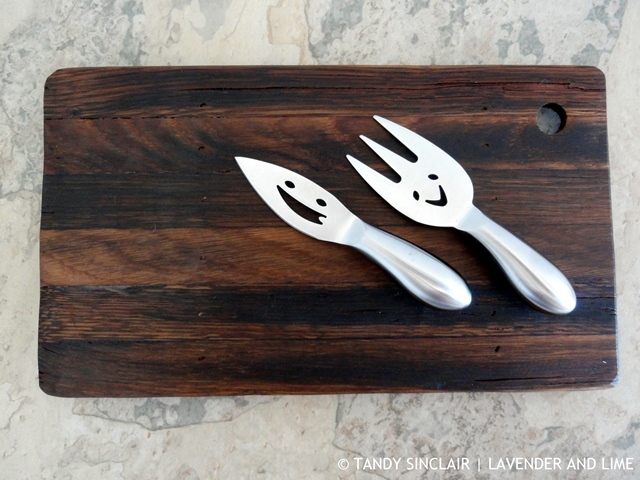 I love peeking at your kitchen…lots of fun stuff Tandy! What a lovely kitchen this month, so many hand things 🙂 speaking of kitchen aid attachments, I would like to purchase the pasta attachment that make penne etc… I don’t use my kitchen aid much any more since purchasing a Thermomix, but I do love the pasta attachment, so I would like to add that, if only I had the room! LOL! G’day and congrats Tandy on your win! Love your cheese board accessories…have those mugs too and always can use a wine opener too! Thanks for another peek in your kitchen. Hard to believe this is the end if the year. Merry Christmas and Happy New Year to you and your family. The cheese board, fork and knife are fantastic! I can’t wait to see what yummy desserts you put in those cups. Oh, I love that cheese board, knife and fork and those espresso mugs are so cute. Love it all but those mugs are especially gorgeous! Love that cheese board and knife n fork set. Hi Tandy, did not know that Kitchen aide had shredding attachments, how cool. Great stuff in your kitchen this month! Ooo I haven’t seen those KitchenAid attachments before! Must check them out. 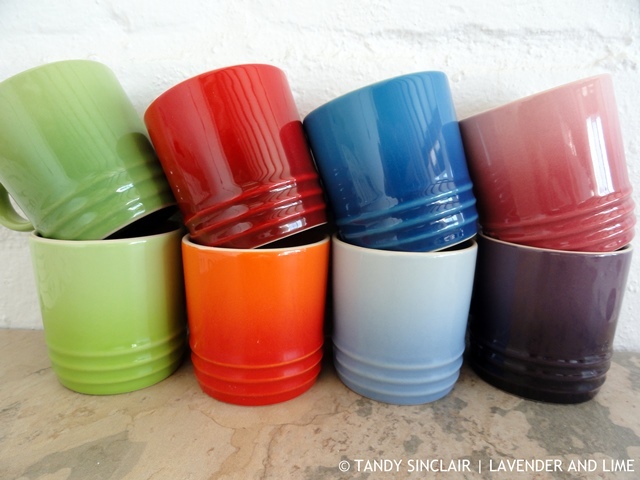 Your espresso mugs are lovely and colourful. Sadly Le Creuset don’t make them in the new cotton which is what I was looking for, even though I am disappointed to hear only the pots are now made in France, everything else in China. I bet you don’t have much more to collect to have everything for you Kitchen Aid – how awesome. Gosh, seems like you’ve been busy getting your kitchen pretty! Love the cheese board and those cute knives! The mugs are so beautiful and colorful! Lovely share, thanks. Can’t believe how the year has flown. Come January I hope to get back in the saddle with the IMK participation.